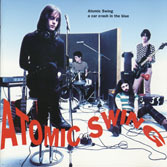 Atomic Swing come back. The English & Japanese translations are here! 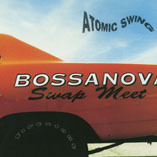 After 10 years - Now is Atomic Swing. Niclas Frisk ready to swing again. Niclas Frisk is getting back his dream band. Niclas back to dream band. 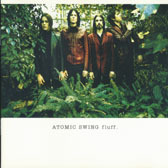 Niclas Frisk gave Atomic Swing a new chance. Welcome back and go to hell. Finnish article for their fans from Finland!! Have you enjoyed the show? I don't know what's written at all more than Swedish..
Dennish article. "Atomic Swing swing again"
Atomic swing appeared as the guest of radio program "Dalatoppen" final show at Falun, Dalarna. There is a photo. It's written "Atomic Swing med morasonen Niklas Frisk uppträder", it means "Atomic Swing with Mora's son Niclas Frisk appear". Niclas was born in Mora, Dalarna. Also they played as the guests of Falukalaset　at Falun on 1st June. Atomic Swing still swing. Live report at Kafe de luxe, Växjö. Niclas interview from Gotland newspaper. They play at Gutekällaren, Visby on 30 June. Have a nice time! Back in the track - Niclas interview. The English & Japanese translation is here!! New lights Atomic swing - Niclas interview. Welcome back, Atomic Swing - Storsjöyran report. Live report from Majas vid havet, Varberg, 2 Aug 2006. - rockin' on (Japanese magazine) Sep - "A Car Crash In The Blue" is selected "90's Best Disc 100"!! Article in Norwegian. They released "Broken Habanas" in Norway 1st Aug. Thanks for many fans from Norway coming to this site! Have a nice time. Live report from Tyrol, Stockholm, 17 Aug 2006. - Radio 3 Bodø - The Flasher is TOP of this week's hitchart!! It's funny! Leif Pagrotsky is mimicking Micke Lohse!! The program is on air SVT Folktoppen - Sat 23 September 2006, 20:00. Don't miss it if you live in Sweden. Missa inte! And the photos are here. Sticky Fingers live report - Atomic Swing gain over all. English & Japanese translation is here! 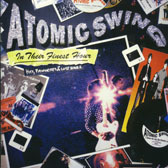 Atomic Swing - Reunion is not temporary - seems written about this site...!!! The English & Japanese translation is here!! Nominated Swedish Grammy 2006, Årets Rockgrupp(Rock group of the year)!!! Atomic Swing forced by rain that discontinue the show. "If they wouldn't discontinue the show, the singer Niclas Frisk had risk of the life." Japanese article. It was on the top news! !